The origins of the smashed-patty burger lack a definitive birthplace, but somewhere in the Midwest would be an informed guess. Freddy’s, based in Wichita, and Schoop’s in Northwest Indiana are two purveyors of the griddle-smashed, crisp-edged burger that’s grown in popularity in recent years. But forced to name a favorite, my answer will always be Steak ‘n Shake. The dual-towns of Bloomington-Normal, Illinois—about a three-hour drive southwest of downtown Chicago—has produced two well-known national companies: State Farm Insurance, and the burger chain Steak ‘n Shake. By measures of QSR, the trade publication of quick-service restaurants, Steak ‘n Shake is the 32nd largest chain in America (between Jersey Mike’s and Checkers/Rally’s). As an adopted Midwesterner myself, Steak ‘n Shake feels very Midwest—humble, reliable, operating without the fanfare or hysteria that a new-to-town Shake Shack or In-N-Out might achieve. There’s much to like about the chain: Steak ‘n Shake is a sit-down, order-from-a-server restaurant, but the price point is closer to fast food’s. A good part of its menu are priced at $3.99 and arrives with a side of shoestring fries. A recent promotion jumped on the in-vogue 4-for-$4 trend in chain restaurants, offering a burger, fries, a cookie, and an additional side for a four-spot. When I dined with my wife and toddler one recent Saturday, we were amazed to walk out of the restaurant fully satiated and having paid only $16, tip included. Of course, its inexpensiveness would be for naught if the food wasn’t good—but no issue here, as Steak ‘n Shake burgers rate in my top-tier among chains. Its griddled crisp beef patty produces its namesake steak flavor, taking advantage of Louis-Camille Maillard’s discovery that browned, seared foods increases its tastiness. And there is perhaps no condiment more satisfying than a few splashes of its bottled banana pepper brine onto the beef. And so, a proper cataloging of its burgers is in order. Over two trips, myself and two Takeout colleagues sampled every burger on Steak ‘n Shake’s menu (caveat: menu offerings vary by location). To ensure we’re tasting the burgers in its optimal state, we ordered no more than three burgers at a time and attempted to sample each within three minutes of the sandwich hitting the table. These 14 sandwiches are listed, in order of preference. Isn’t the point of a fried egg-topped burger for the rich yolk to ooze and shellack everything beneath? If not, it’s just an extraneous flavor-void flab that adds nothing, and in fact, subtracts. The pleasures of that seared, beefy crust is rendered null by the overwhelming barbecue sauce and fried onions. Not that the sauce isn’t delicious, but it’s all you can practically taste. Might as well be something you order from Burger King. To a lesser degree than the Western BBQ above, this burger’s fatal flow is there’s too much crowding that crisp beef—jalapeno coins, chipotle mayo, fried onions. It’s too busy. See a pattern here? The burgers I find less appealing are the ones with add-ons. This one’s on the acceptable end of the spectrum, though—grilled onions, Swiss cheese, and mushrooms are fairly complementary to the beef. Now we enter the part of the menu where burgers arrive unadorned, just meat, cheese, bread, and bare accoutrements. The reason this lands on the lower half of our rankings is the Cajun mayonnaise, an assertive and heavily seasoned sauce. I’m picking up a lot of chili and paprika, which is delicious in many applications but not necessarily a burger. New to the menu is Steak ‘n Shake’s Prime Steakburger line, which utilizes a 6 oz. brisket/chuck-blend patty and brioche buns. The original Prime burger (there are two other varieties, found later on this list) is dressed with the standard lettuce-tomato-pickle-onion combination, with American cheese. Some of that crisp texture is sacrificed for a juicier patty. This is the type of burger you’d encounter at a friendly neighborhood diner. One of my taste-testers mentioned how the Frisco Melt was tops on his list, but that it could be attributed to nostalgia. 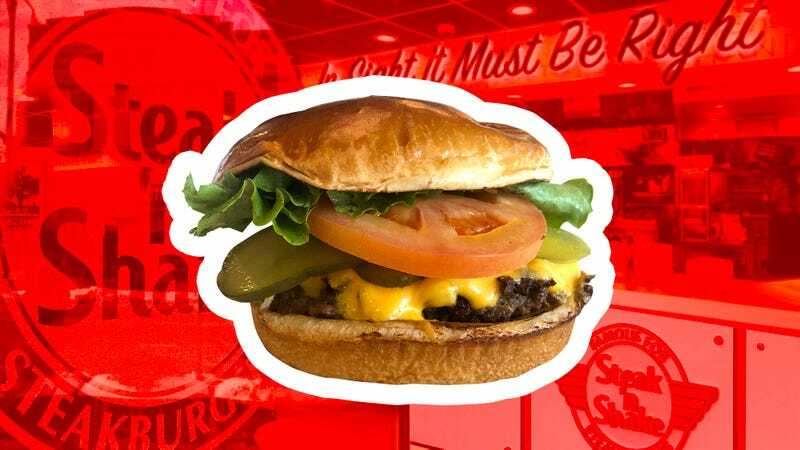 It’s got all the classic Steak ‘n Shake elements—two patties, two types of cheese, two buttered Sourdough toast, and the namesake Frisco sauce, a condiment occupying that same space as French dressing/Thousand Island/Special Sauce/mayochup. This would be so satisfying to eat at 2 a.m. If the Frisco Melt is level one of Steak ‘n Shake’s burger-sandwich potential, the Patty Melt is second-semester: the same two beef patties with American cheese, tangles of soft and nearly candy-sweet caramelized onions, and sturdy slices of rye bread. The caraway seed flavor is rather pronounced. What if you ate an above-average griddled burger with toasted garlic bread as buns? This is the result. It is marvelous. What stops this from entering my top three is the garlic sauce has this slight acidic tang, and not as roasted, mellow, nor natural as I’d like. If they can tweak that garlic sauce recipe, this burger would rule even harder. Essentially the Prime Steakburger that occupies the ninth spot, but with two different types of cheese (cheddar, Swiss) and a generous ladle of that Frisco sauce. A buck more than the original, and worth it. The differences between our top four burgers are negligible. At this point of our rankings, all the sandwiches are top-tier. Crisp bacon sandwiched between two lacy patties, held together by cheese, with the necessary B.L.T. accoutrements, makes for a splendid burger. Normally I’d eschew the indulgent, over-the-top burgers, but this was the rare example where less isn’t more. Impossible to consume except with knife-and-fork, this burger uses Steak ‘n Shake’s 6 oz. thick patty, topped with a pile of mushrooms and onions, and overflowing with an ultra-rich truffled aioli sauce. It’s a burger I didn’t want to like, but daggummit, it really works. Why place this burger higher on the list than the exact same sandwich with bacon two spots lower? Purity. The O.G. The classic. Bacon is nice, sure, but it adds a high-gloss finish when none is really needed. At the $3.99 price point, this is one of the best deals in the restaurant industry. The finest burger on the Steak ‘n Shake menu should be reserved for special occasions. A sandwich of perfect engineering, where every component is necessary and complementary. It begins with that base crispy double patty and cheese, with those toasted pillowy buns. Add sweet caramelized onions and an imprudent amount of butter, melting into a moat surrounding the burger—it’s a dish that may start a religion, or at the least, having you praying to a higher power.